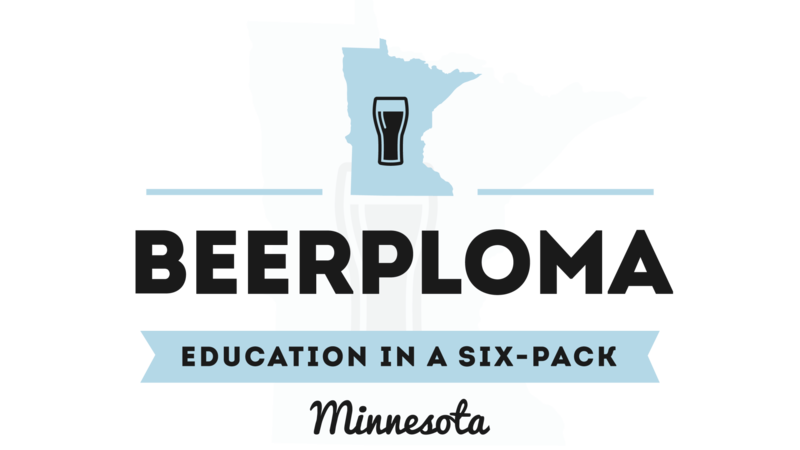 The entire purpose of my beercation is to immerse myself in this storied beer destination. It feels surreal finally driving the streets of Portland and being inundated with the random art, beautiful yards, and bikers. I have to figure out what this place is all about. Why does Portland have such a reputation for being weird? Will it be too weird for me? Am I going to enjoy the weirdness and not want to leave? Can the beer possibly live up to the hype that has been building up in my head for years? The only way to answer these questions is to spend the next ten days here. Being from the land of Paul Bunyan, it makes sense that the first brewery I try has a lumberjack as its mascot. 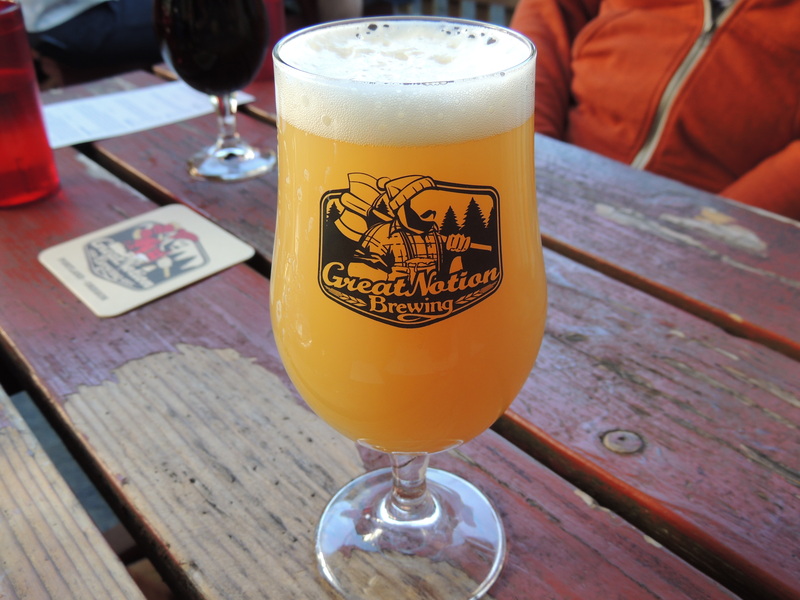 Great Notion Brewing gets a lot of hype for their beer. I am drawn here because of that hype and I want to see if the beers live up to that hype. I am accompanied by the crew from our Hood River adventure. 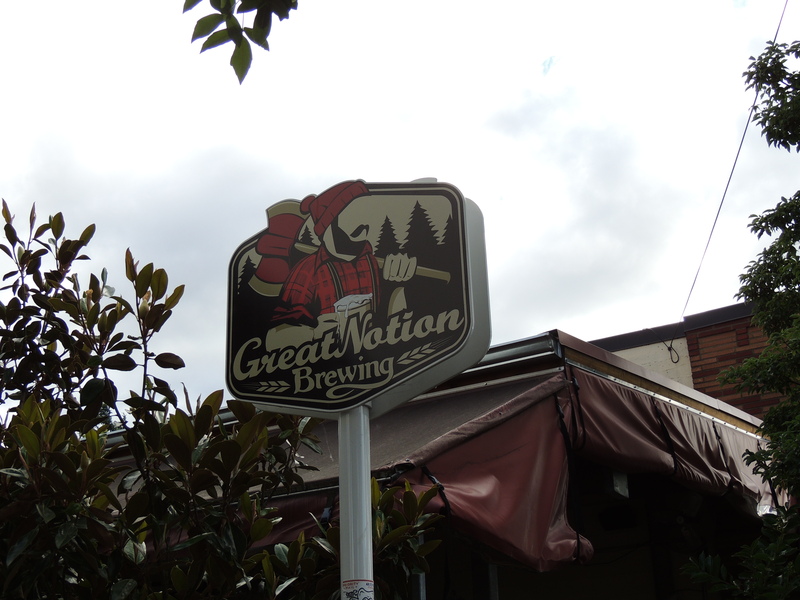 We are thirsty and ready to see what Great Notion is all about. We order tasters of everything on the menu and get drinking. There is quite a bit of silence followed by some oohs and ahhs. Initial sips reveal exquisite flavors, aromas, and craftsmanship in the beers. I can honestly say that from the fruited sours, IPAs, and darker richer stouts, all the beers are fantastic. The Blueberry Muffin has every appealing flavor from the sweet bready flavor to the succulent, sweet, and juicy ripe blueberry flavor. Aroma-wise, the Blueberry Muffin is marvelous and enticing. All of their IPAs showcase the hoppy goodness and flavors that go with them superbly. My favorites of the hoppy offerings are the Ripe IPA and the Juice Jr. However, it is when we get to the stouts that Great Notion really lets out the wonderment clutch. The Supple, a milk stout, is full of chocolate, vanilla, and a little bit of maple sugar. I am worried that this one is going to be on the cloying side of sweet, but I am proven wrong by its balance. Smooth and easy drinking, the Supple i s a pleasing introduction to what Great Notion can do with a stout. 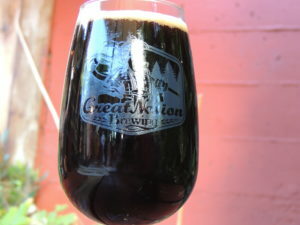 The Double Stack is literally breakfast in a glass and another audacious and decadent stout from Great Notion. Coffee and maple syrup are the centerstage flavors of this headliner. As aromatic as Blueberry Muffin is, this Double Stack might be better. The coffee adds a richness and an edge to this beer. Last, but certainly not least for me is the Peanut Brother Peanut Butter Stout. This is as close to perfection as a stout can be. Rich and roasty, this beer has a bountiful body to it. Peanut Brother is a showstopper and it is telling that 3 out of the 5 of us order a snifter of it after we demolish all the tasters. Because of its high quality and variety of beers on tap, I will be back here again before my beercation is over. I am finding the article I read on Portland must-visit breweries to be extremely helpful. 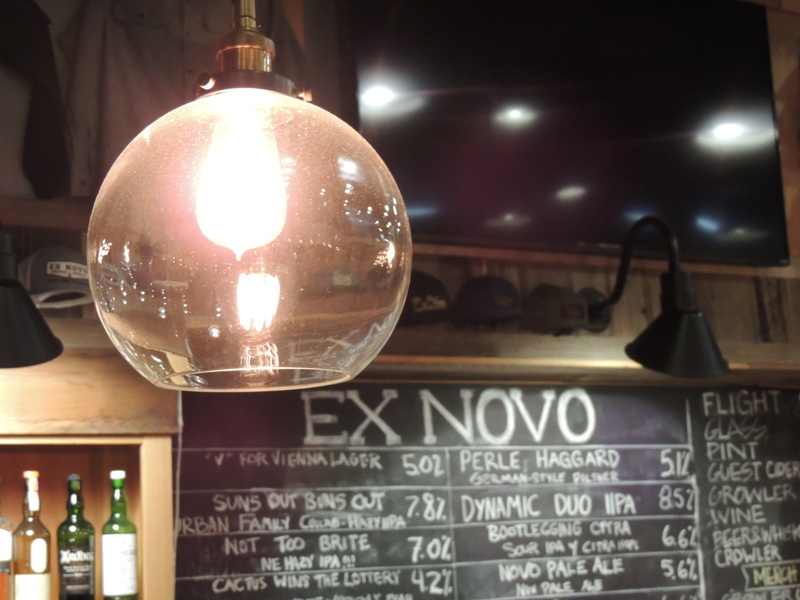 Ex Novo Brewing is on that list and that is where we meet for dinner and more beer. 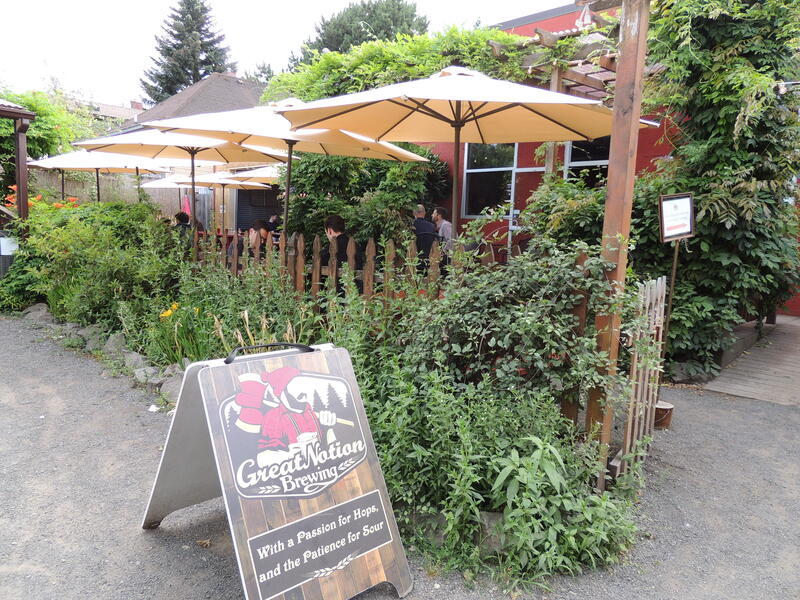 What initially jumps out to me is that most of the Portland breweries exist in the heart of residential neighborhoods. 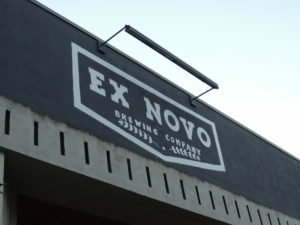 Ex Novo Brewing is in the Eliot neighborhood and not far from Eric and Sarajo’s Airbnb. Ex Novo also give all their profits to charity, so it is a great place to support. I arrive a little later than my friends after checking into my lodgings. 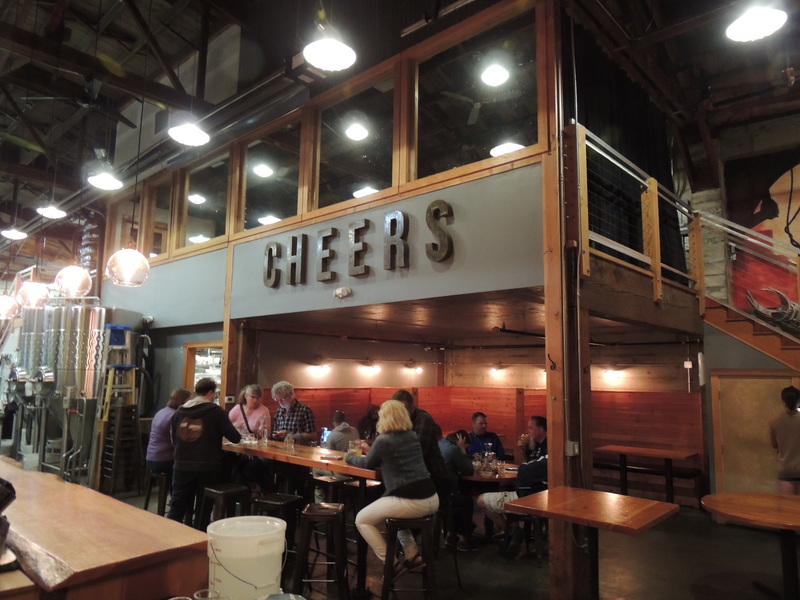 The lights are low in the taproom to add a cozy element to the atmosphere. Like good beer travelers, my compatriots have already procured tasters of all the beers. There are more hits than misses here. Where Ex Novo has a leg up on the competition is that they have a genius in charge of naming the beers. Beer names like Perle Haggard (Pilsner) get you laughing and drinking all at the same time. Speaking of the Perle Haggard (pilsner), it is one of my favorite beers that they have. I like the austerity of the Perle Haggard due to its clean and crisp nature. Along the same lager lines as the pilsner, V Is For Vienna Lager is also great. I like the slight roasted malt in this one that comes off as a nice toast flavor. The V Is For Vienna Lager is also crisp and drinkable. The next beer I thought was well above average is the Stiff Upper Lip, a well-made English Bitter. Stiff Upper Lip has a bready malt flavor to it backed up nicely with hops that balance out the sip. The Novo Pale Ale is probably my favorite of all the beers I taste. Oregon pale ale that is bright and aromatic that ends with a pleasing bitterness. The Novo Pale Ale is balanced and the flavor shifts in the taste are discernible and clear. Just when you think it can’t get any better, our food arrives. We all order something different and the tastes are unique and inspiring. My only gripe is that the fish and chips are over-fried. From a Caprese Salad dish to Mac and Cheese, the food all tastes wonderful. Our entire experience is punctuated by the comedic stylings and warm demeanor of Will, our server, and bartender. He is sarcastic and really pushes our stay into the “I Want To Move In” zone. I am always a fan of great beer and food, but when you add in a wonderfully friendly server, I give the experience incredibly high marks. Will is the one who recommends that Denise pours a little bit of beer cheese soup onto her mac and cheese. From where I stand, the culinary magnificence of that choice should earn Will a Nobel Peace Prize. No doubt, a bite of this amazing confluence of cheese, texture, and comfort would put even the angriest of feuding world leaders in a happy place. The night is in full swing and my eyelids are now heavy from sleep and possibly the bite of beer cheese laden mac and cheese. We settle up and I head back to my lodgings. The rest of the crew finish up with a cocktail, but I am ready for bed. 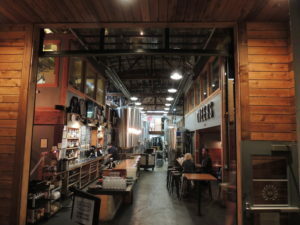 Tomorrow will be a full day of wandering around Portland and drinking more fantastic beers. Today set the bar high and I am skeptical about whether or not it can be raised again. Answering that question will be all in another day of beercation. Prost! If you like reading about the Portland trip, give our latest A One Pint Stand podcast episode a listen as Dan and Eric recap their adventures.